Known as one of the hottest acts in the world, Johnny Cash transcends all musical genres and leaves audiences from prisoners to presidents wanting more. Johnny Cash had a successful career spanning over five decades. He gave the world a basic and distinct sound that will be enjoyed for generations. The Man in Black is an extraordinary musical icon and has been honored worldwide. Now is your chance to experience the songs and music live. With his deep, resonant baritone, Marcel Soulodre makes this tribute a concert to remember. As an accomplished Manitoba singer/songwriter, Marcel engages you in some of the greatest music of all time with the voice, rhythm and look that will leave you wanting more. 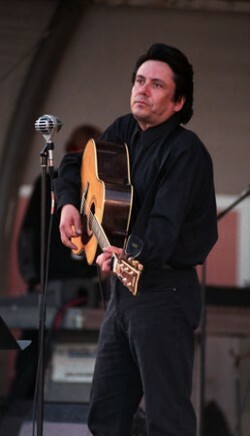 Wanted Man: A Tribute To Johnny Cash entertains audiences universally. Experience the outlaw phenomenon in the rhythm and music that made Johnny Cash a true legend, by the greatest living interpreter of Johnny Cash songs.